Philips today launched a big update to the Hue app that provides users with control over their network connected Philips Hue lighting system which the company began selling exclusively through Apple Stores last year. Version 1.1 of the app adds a ton of new features including Geofencing to trigger scenes when you leave or return home, recurring schedules for functions such as alarms, a new synchronous scenes, and much more. 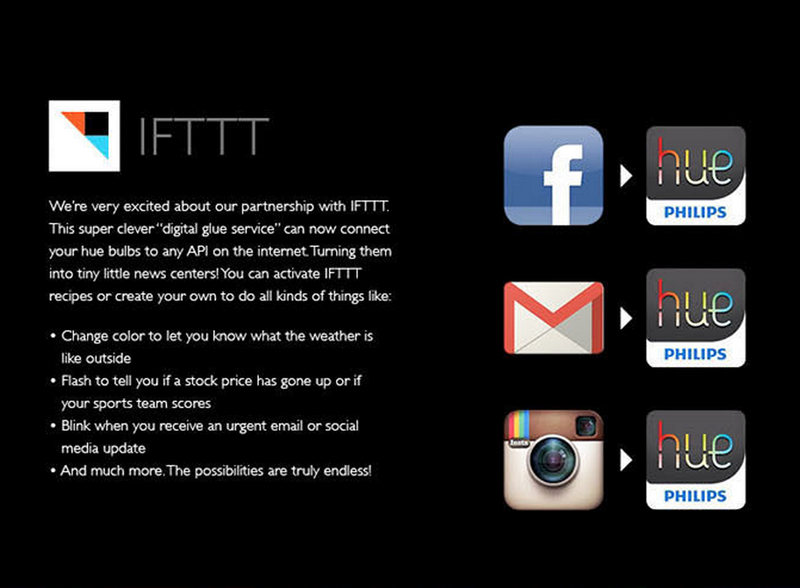 One of the big announcements accompanying the launch of the updated app is a new IFTTT (If This Then That) channel for Hue. IFTTT is a service that allows online applications to talk to one another by letting users set up actions for one app that are triggered by another. For example, with the Hue channel, users can have “access to any application programming interface (API) on the Internet, allowing Hue smart bulbs to act as informational gateways and visual cues for updates on weather, stock quotes, sports scores, email, social media and more.” Imagine getting a notification through Hue related to a weather forecast or update on a social network. The Philips Hue starter kit is available now for $199 with 3 bulbs and additional bulbs are available to purchase for $59 each.